This week brought one of my most anticipated books of 2014, and I also bought (and read) a novella. Both of these are by New York Times bestselling authors who write awesome books. The InCryptid universe is a fun place to visit, and I just love the Price family so I’m pretty excited about reading this one! Half-Off Ragnarok is primarily about Alex, the brother of Verity (the main character from the first two books). I already like his girlfriend from the plot description since she, like me, is fond of big cats. Half-Off Ragnarok will be released on March 4, 2014 (mass market paperback, ebook). If you’re in the US, you can enter to win a copy on Goodreads through January 4. The first two books in the series are Discount Armageddon and Midnight Blue-Light Special, respectively. When Alex Price agreed to go to Ohio to oversee a basilisk breeding program and assist in the recovery of his psychic cousin, he didn’t expect people to start dropping dead. But bodies are cropping up at the zoo where he works, and his girlfriend—Shelby Tanner, an Australian zoologist with a fondness for big cats—is starting to get suspicious. The third book in the InCryptid series takes us to a new location and a new member of the family, as Alex tries to balance life, work, and the strong desire not to become a piece of garden statuary. Old friends and new are on the scene, and danger lurks around every corner. Of course, so do the talking mice. If Laini Taylor writes a book, I will buy and read it—which I did soon after learning that the ebook set in the world of Daughter of Smoke and Bone was now available. It’s a novella about Zuzana and what happened when she decided to sweep Mik off his feet. I didn’t love it as much as the full-length novels, but it was definitely worth the $2.99 I spent on it. 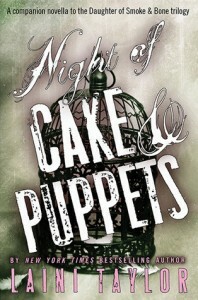 Night of Cake and Puppets is also available as an audiobook. 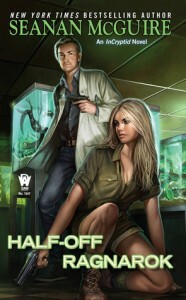 There’s some background information on the novella on the author’s website and an excerpt on Entertainment Weekly. In this new stand-alone novella from New York Times bestselling author Laini Taylor comes the story of a romantic, funny, and fantastical first date. In Night of Cake & Puppets, Taylor brings to life a night only hinted at in the Daughter of Smoke & Bone Trilogy–the magical first date of fan-favorites Zuzana and Mik. Told in alternating perspectives, it’s the perfect love story for fans of the series and new readers alike. Petite though she may be, Zuzana is not known for timidity. Her best friend, Karou, calls her “rabid fairy,” her “voodoo eyes” are said to freeze blood, and even her older brother fears her wrath. But when it comes to the simple matter of talking to Mik, or “Violin Boy,” her courage deserts her. Now, enough is enough. Zuzana is determined to meet him, and she has a fistful of magic and a plan. It’s a wonderfully elaborate treasure hunt of a plan that will take Mik all over Prague on a cold winter’s night before finally leading him to the treasure: herself! Violin Boy’s not going to know what hit him.